The Knitted Garden: Did I Mention I Was Published? so sweet and so appologetic and promptly sent me the corrections. We struck up an internet freindship and a few months later, she contacted me to say she was flying into LA from New Zealand where she had been on a wool sebatical for the last 2 years (How does one get a gig like that?) and would I like to help coordinate some workshops for her. I, of course, jumped at the chance and voila! There she was in my home dying wool and silks with Austrailian Flax, Cochineal Bugs, Indigo and Osage. I was in heaven! 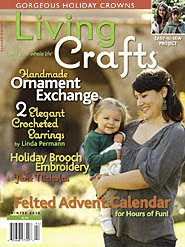 So here I was a few months later, desperate to be a part of an ornament exchange for one of my favorite magazines and she was the coordinator. Needless to say, I got on as an alternate. She outlined the theme and the medium we should use and I started submitting ideas. and some hand-dipped pine cones. All such simple ideas which I was almost embarrased to submit but I thought simple might be better since not everyone who reads the magazine is an experienced craftsperson. Surprisingly, two of my ideas were chosen, the Scherrenschnitte angels and the dipped pine cones. We each had to make multiple ornaments, (I had to make multiples of both) and have them turned in by the end of summer so they could be distributed to the other participants along with all instructions and photographs. When the magazine hit the stands in late fall, I was thrilled to see that my Sherrenschnitte angels had made it in the issue while so many others had not. I was also told that my pine cones would be featured in a future issue! So why the heck did it take me so long to tell anyone? Well, life is so full that I just put it aside and relished it within my own little circle. So I'm putting it out there folks...Let's Celebrate!